ADDRESS: 3014 Banks Road, Tallahassee, FL 32309. Thomasville Road to Foxcroft, left on Heathe, right on Parrish, right on Banks. SQUARE FEET: 2007 sq. ft.
OTHER: Unique contemporary in Foxcroft. Wooded pie shaped lot with lots of spring flowering azaleas. Two story peaked living room ceiling; floor to ceiling limestone fireplace. Floor to ceiling front windows facing western sunsets. Loft family room up overlooking living room down. 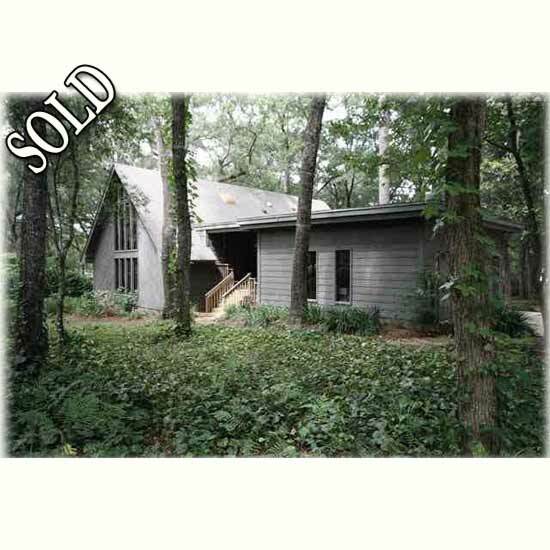 Wood floors in LR-DR. Master bedroom up; peaked ceiling with deck overlooking backyard. Contemporary master bath w/sky lights. Other two BRs down w/hall bath. Breezeway to separate 2 car garage.